We’d love your help. 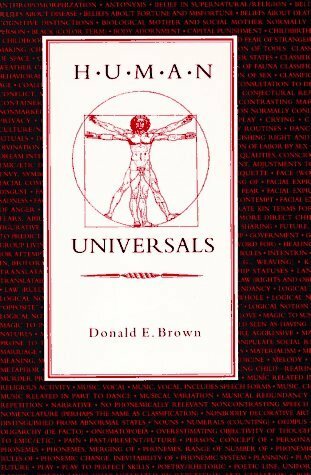 Let us know what’s wrong with this preview of Human Universals by Donald E. Brown. This book covers physical and behavioural characteristics that can be considered universal among all cultures and people. The text is divided into three parts: the problems posed for anthropology by universals; six important studies that have forced anthropologists to rethink; and the distinctions between linguistic, cultural and social universals. To ask other readers questions about Human Universals, please sign up. i want to read this book "HUMAN UNIVERSALS" but i m unable to get it..How can i access this book online..plz guide. Abu Dhabi Well, I'm not going to tell you to pirate it, but I bought mine on ebay. You can get them at like 50 bucks apiece. Brown provides a detailed history of how anthropology has resisted the notion of human universals. He summarizes the prevailing (1991) paradigm in anthropology as follows: All that is meaningful in human behavoir is influenced (determined?) by sociological and cultural forces. To the extent that we have a common human nature, it involves our animal nature and, as that is in common to all, it is not significant in its influence over the evident variety we see in human affairs. Brown does a good jo Brown provides a detailed history of how anthropology has resisted the notion of human universals. He summarizes the prevailing (1991) paradigm in anthropology as follows: All that is meaningful in human behavoir is influenced (determined?) by sociological and cultural forces. To the extent that we have a common human nature, it involves our animal nature and, as that is in common to all, it is not significant in its influence over the evident variety we see in human affairs. Are there universals in human behavior? If so, what might these behaviors include? Those are key questions posed--and answered--by Brown. To illustrate, these are among his "universal behaviors": males engage in coalitional violence, oligarchy, dominance and submission behavior, leaders, economic inequality, prestige inequality. One can always question judgments as to what comprises universal human behavior. But the cataloging by Brown is a useful step and sure to generate discussion. Likely the authoritative anthropological work describing global cultural universals. Dr. Brown defines clearly and discusses the history of the study of human universals from the standpoint of sociobiology. Most of the book is an exhaustive review of the history of the concept of universals within anthropology, and the controversy around it. The last third talks about a few examples of universals that have been found, which have strong evidence. The most compelling part came at the end, where Brown turned the method of study in anthropology on anthropology itself, analyzing why the field came to its early conclusions, making culture an irreducible subject, and why later a minority of anthropologists Most of the book is an exhaustive review of the history of the concept of universals within anthropology, and the controversy around it. The last third talks about a few examples of universals that have been found, which have strong evidence. The most compelling part came at the end, where Brown turned the method of study in anthropology on anthropology itself, analyzing why the field came to its early conclusions, making culture an irreducible subject, and why later a minority of anthropologists began to accept biological origins for culture, as universals. He explained that despite the findings of this minority, anthropology still relegates the concept of universals to a minor role in the study of humanity, and continues to place culture and cultural relativism front and center. I really enjoyed reading Brown's conclusions about the field, and I went through his bibliography with interest. Being a newcomer to anthropology, this was a pretty dry read. I read this book on a recommendation from someone who has a degree in anthropology. He's recommended I study the subject to address some concerns I have. From what he had said about it in the past, I thought the concept of universals was much more accepted in the field. So I was surprised to learn that it's still controversial. I guess it could be said this book is a good introduction to that controversy. I've gone back and forth on whether this is a good introductory text on the subject of universals itself. It felt like it was written for people who are already familiar with some background in the field. El énfasis está en el descubrimiento de diferencias entre culturas, a más diferencias mayores méritos científicos del investigador. ¿Por qué no tomar la otra ruta y no olvidarse de las similitudes entre culturas? Son muchas más que las diferencias y eso muestra algo. CAN ANYONE PLEASE SEND ME AN EBOOK OF "HUMAN UNIVERSALS". I want to read it please.